Customers are looking for you, and your menu, on their smartphones. If you’re not targeting these people, you’ve probably already lost customers to a restaurant that does. It’s no secret that there’s a mobile explosion underway, and Google reports that 94% of smartphone users look for local information on their phone, and 90% of those take action as a result. 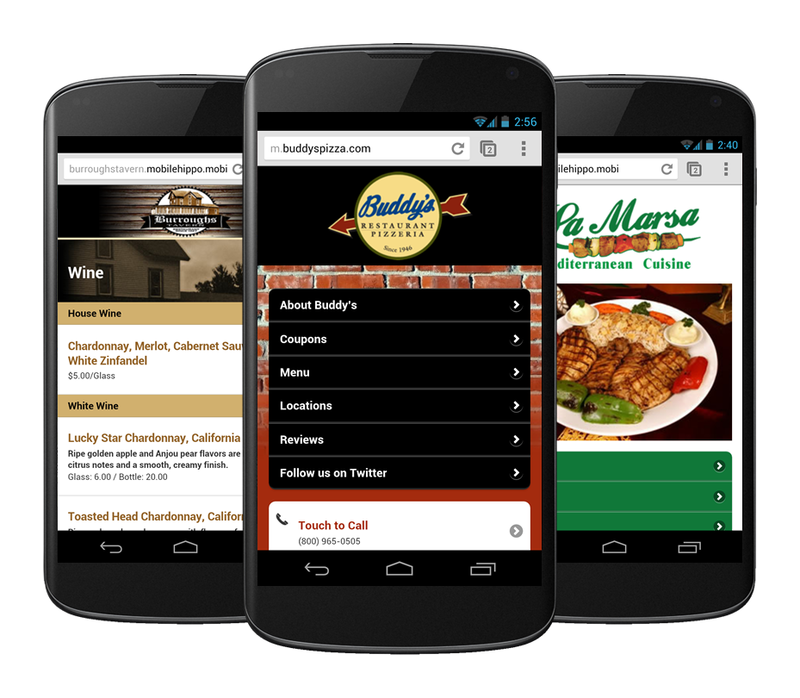 In order to make their experience as inviting as possible, your restaurant needs a mobile-friendly website. MobileHippo enables you to build a mobile website that will help you attract customers and interact with them to keep them coming back. MobileHippo has numerous features that will engage your customers and make it easy for them to find the information they need. How Do I Know If It Is Working for Me? MobileHippo's activity reports enable you to view which pages are the most popular on your mobile website, and which devices are being used to view your mobile website. If you're taking advantage of MobileHippo's QR code generator, our activity reports will even show you how many times your QR codes are getting scanned. This, coupled with Google Analytics will give you the ability to see the positive effect your mobile website is having on your restaurant. MobileHippo’s mobile website builder enables do-it-yourselfers to quickly and easily create a mobile-friendly website. Too swamped to build it yourself? One of our mobile design experts can build it for you. Either way, your restaurant will benefit from serving customers on the go. It's easy for the logos to get out-of-date, design advancements change, content in addition to develop naturally which can result in a website design that is messy, difficult to make use of in addition to through synch together with your brand name -- Stop Comment Spam on a Word Press Site . Having a mobile website is crucial for business today, especially for a restaurant. Most of the customers tend to do their research for places to dine using various mobile devices so your restaraunt's assets should be easily approachable for them. Also, make sure you are featured on Google reviews and have a review of Smartwritingservice to attract customers to click on your website link.